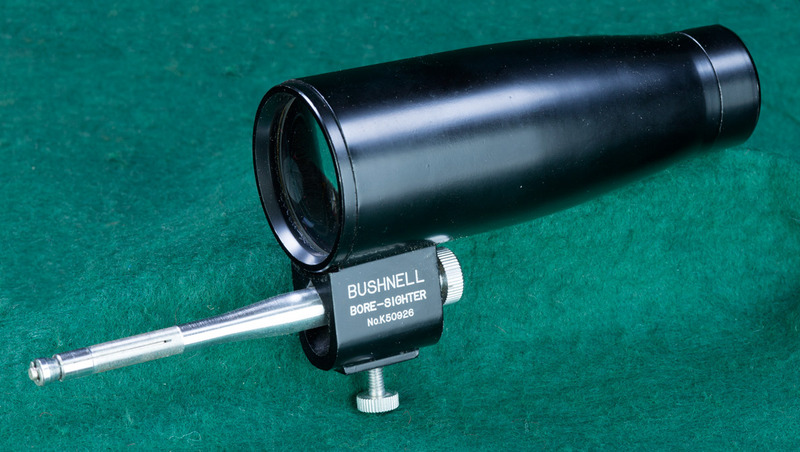 Collimator, for use in bore sighting a rifle without a trip to a range. Bore Sight - A process by which sights are adjusted to converge on the same line as the bore. Accomplished by placing a rifle in a rest, sighting down the open bore on a prominent distant point at an appropriate range, then aligning the sights to superimpose on the same point. Alternatively, bore-sighting may be accomplished with a device known as a collimator mounted to the muzzle of a rifle with a mandrel sized precisely to the bore. The process should conserve ammunition when sighting-in a rifle by approaching proper sight adjustment before actually firing the rifle with live ammunition.